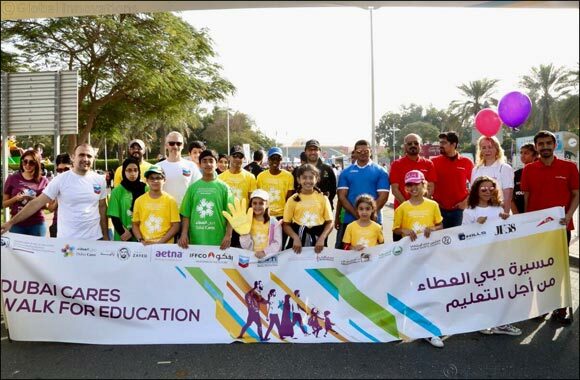 Dubai, United Arab Emirates – 3 February, 2019: Dubai Cares, part of Mohammed bin Rashid Al Maktoum Global Initiatives, has announced a spectacular line-up to mark the 10th anniversary of its annual Walk for Education. The event will take place on Friday 15 February, 2019 at Dubai Creek Park, next to Al Garhoud Bridge, Gate 2. Dubai Cares invites members of the UAE community to participate alongside family, friends and colleagues to walk 4,000 steps (3km) in solidarity with millions of children in developing countries who walk long distances every day to go to school. This symbolic three-kilometer walk also aims to raise awareness about the importance of providing underprivileged children and young people around the world with access to quality education. The walk will be co-hosted by radio presenters Abdulla Ismail and Saif and Sound, joined by Dubai-based DJ Keza. The carnival themed event will be complemented by a family-friendly lineup of pre- and post-walk entertainment inside the park, including face painting, hair braiding, carnival games, music and traditional dance in addition to a fun-filled program of entertainment activities including, hula hoop, bouncy castles and arts and crafts stations. The program also includes sport activities that will be handled by DuPlays. In addition, attendees will get to savour delicious food and drink by visiting pop-up food and beverage stalls from Costa, Ice cream Lab, Kulcha King, Mom's Crepe and Subway. The Walk celebration will include a fantastic parade of bands and heritage dance groups representing different cultures and nationalities, such as the Dubai Police band, a traditional Emirati performance presented by the students of the Ministry of Education, the Agha Khan Scouts and Guides Band, a choir performed by the GEMS Modern Academy's students, an Indian classical dance performed by GEMS Millennium school as well as the Dubai Drums. This year's main sponsor is Aetna, joined by Chevron as a sponsor. Subway was the first organization to sign up and confirm the participation of 2,000 people. Al Tayer Group and The Kindergarten Starters have once again demonstrated tremendous enthusiasm by signing up, and confirming the participation of 1,500 staff and 1,000 students and staff respectively. Dubai Cares' other supporting partners for the Walk for Education 2019 include Arabian Radio Network (ARN), Dubai Corporation for Ambulance Services, Dubai Municipality, Dubai Police, Dubai Sports Council, ExpatWoman, JK58, Hills Advertising, Virgin Megastore Ticket, VOX Cinemas, ITP Media Group, RTA, UAE Exchange.